World No 12, making his debut in Ryder Cup, says "I fancy our chances, I really do". Tommy Fleetwood insists Europe will be undaunted by the challenge of going up against a Team USA side boasting Tiger Woods and Phil Mickelson at the Ryder Cup. The 27-year-old is one of five rookies in Thomas Bjorn's team at Le Golf National in Paris as they aim to regain the trophy from September 28-30, live on Sky Sports Golf. All the latest news ahead of the Ryder Cup at Le Golf National. Fleetwood, who will finish his debut campaign on the PGA Tour by playing in the season-ending Tour Championship next week, says the European side will not fear who he describes as "the best golfers ever". You can't deny that they're the best golfers ever and they always will be. But when you tee it up you're just playing another golfer, it doesn't matter who it is. "Most of us guys on the European team play on the same tournaments against Phil and Tiger week in, week out at the moment," Fleetwood said, after following Team USA's Patrick Reed in confirming his participation at November's Hong Kong Open. "You can't deny that they're the best golfers ever and they always will be. But when you tee it up you're just playing another golfer, it doesn't matter who it is." He added: "It will help their team in an experience sense, because they've played so many Ryder Cups, but it will make no difference to us." 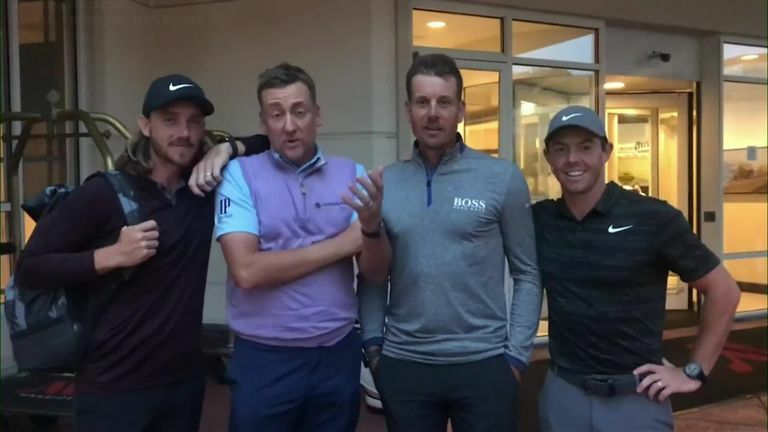 Watch Europe's Ryder Cup team-mates prank Thomas Bjorn! Woods and Mickelson headline an American side, led by captain Jim Furyk, which features three of this year's four major champions and six of the world's top 10. European skipper Bjorn opted for experience in his four picks, Paul Casey Sergio Garcia, Henrik Stenson and Ian Poulter completing the 12-man team, and Fleetwood is confident in maintaining their strong winning run on home soil. "There's been a lot of talk how good the American side is and there's no doubt it, they've got an unbelievable team," said the world No 12. "But I think at the same time Europe has too. I honestly think it could be one of the best Ryder Cups ever... I fancy our chances, I really do." Watch the Ryder Cup from September 28-30 live on Sky Sports Golf.